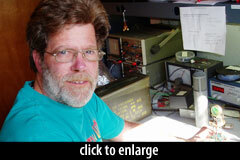 David Royer has been designing microphones for over 30 years. 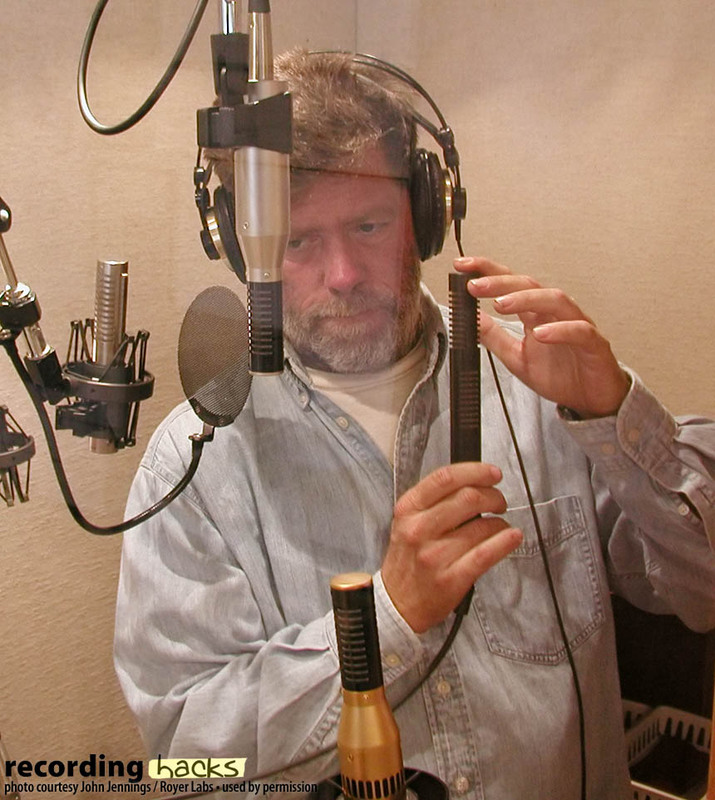 His ribbon microphones are used in studios all over the world. 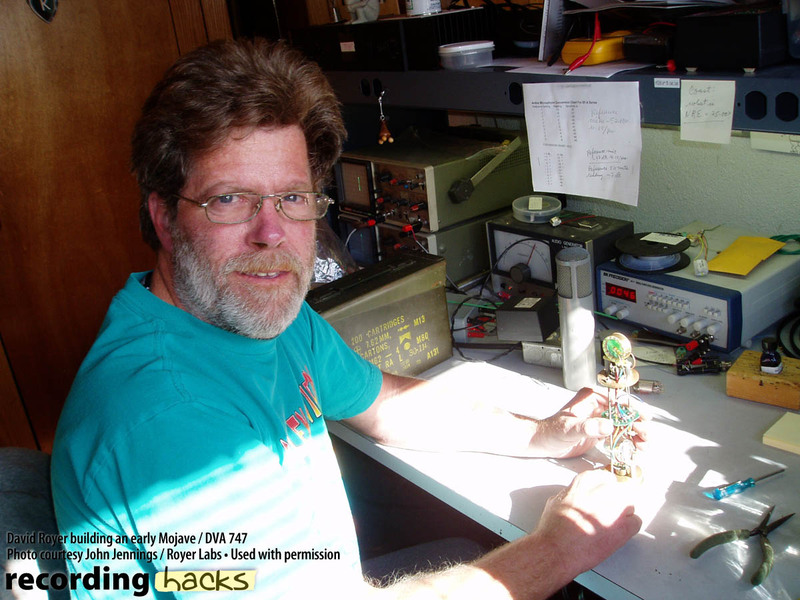 His landmark MXL 2001 tube mod article has inspired countless audio engineers to rebuild and upgrade their inexpensive condenser microphones. And his Mojave Audio condenser mics have earned rave reviews from a roster of celebrity artists and engineers. 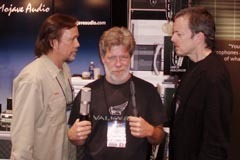 I always enjoy chatting with David at the various audio trade shows, and I invariably learn something. But we usually talk about new products. For this interview I wanted to go back in time and get some of the history on one of his earliest and most popular microphones. Royer Labs in best known for the R-121. This microphone launched Royer Labs, and in a sense, it also launched the contemporary ribbon microphone industry. Can you tell us how the R-121 was developed? DR: I started experimenting with ribbon microphones as long ago as the mid 1970s; I scrounged an RCA Varacoustic. In those days, though, once the ribbon in that microphone went south, I was flat-footed and it wasn’t until about 1993 that I dabbled in ribbon microphones again. I tried my hand at re-ribboning a Reslo microphone, with advice and foil from Bob Speiden, and I eventually got the hang of it. I went on to cobble together a few ribbon microphones from odds and ends and from then on I was hooked, except that no suitable output transformers were available. I had to make do with a less than ideal transformer. Those very first microphones had such low output that the noise was too high for professional use, and it took some work to sort out what I needed to do to build a ribbon microphone with a high-enough sensitivity to be satisfactory. 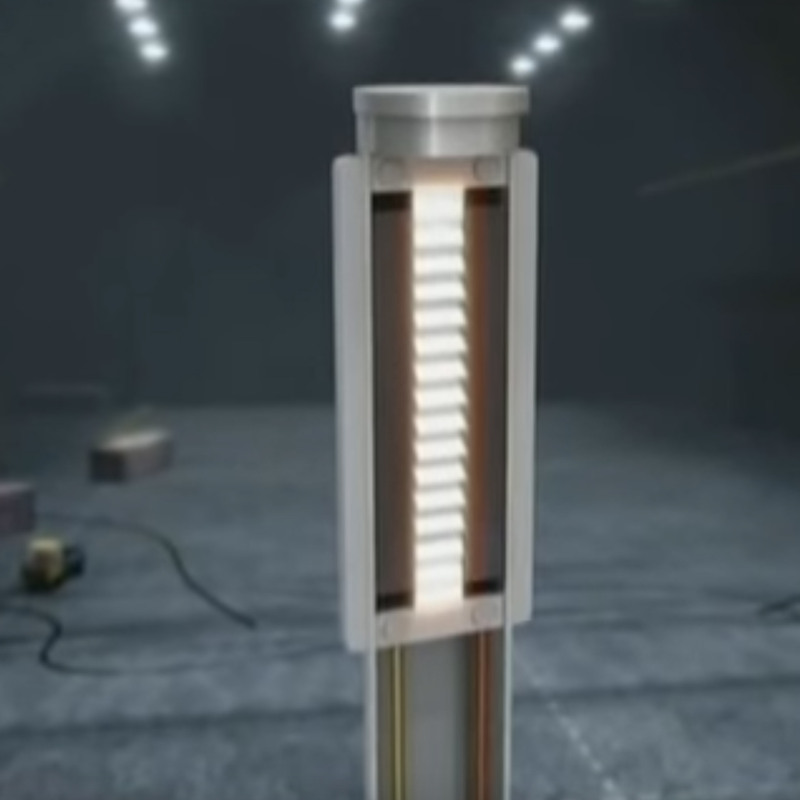 The two things that were tripping me up were unsatisfactory output transformers, and too weak of a magnetic field in the vicinity of the ribbon. Some neodymium bar magnets and suitable matching transformers were major stepping stones toward a viable microphone design. Then it seemed reasonable to go to a machinist to make some “real” microphone parts for me. Those microphones led directly to the R-121. Were those very early ribbon microphones sold under the Royer Labs name? DR: Actually, they were sold under the Mojave Audio name. Until the official launch of Mojave Audio as we know it now, I used that same name when I was a “lone wolf,” which happened a few times between 1983 and 1998. After the demise of DVA [Dunmore Vintage Audio, another early Royer company –Ed. ], I was back to doing business as Mojave Audio for about a year, until Royer Labs got off the ground. The early Mojave ribbon microphone looks very much like an R-121, except it is about an inch shorter and it has a short captive cable. 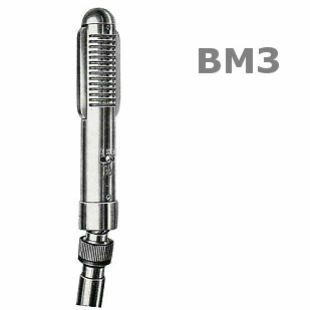 The R-121 has some visual similarities to an old Bang & Olufsen mic, the BM3. 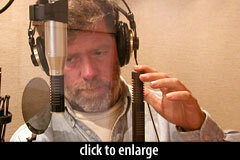 DR: In about 1994 a pair of Bang & Olufsen microphones showed up at my door, all in pieces. Once I got them to work, I was quite impressed with them, except that the output was far too low to be satisfactory for recording soft music with a digital recorder. The output was around -65dB re 1V/Pa [aka ~0.56 mV/Pa, suitable only for loud sources –Ed.]. My problem was to try to figure out how to start with that basic design and get the output up to something useful, at least -54dB. It took quite a bit of prototyping, measuring and cursing to develop a ribbon microphone that I felt would be commercially viable. Are there benefits from using a smallish body tube, with the ribbon frame extending beyond it, as compared to just using a fatter tube? DR: Making the body tube fatter allows for more screening inside the microphone, but it sets the stage for uneven frequency response with a side-address microphone because the space between the microphone element and the inside of the case is large enough to support standing waves in the very highest frequencies. This leads to comb-filtering effects. As the case is made larger, the effect is shifted to progressively lower frequencies. The dimensions chosen for the Royer microphones were found to be a reasonable compromise between size, sensitivity and high frequency smoothness. The ribbon in your R-series motor is “offset,” meaning it is mounted slightly forward in relation to the magnets. This gives the mic higher SPL handling on the front, and a brighter response on the rear side. 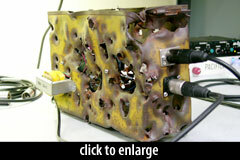 Did you develop this design based on experimentation? DR: I would love to be able to claim that I intentionally came up with that design! The design of the R-121 sort of fell into place, and then we discovered the “fringe benefits” of the design after the fact. I designed the original Mojave version of the mic around a standard rectangular magnet, and the “offset” design was carried over from the Mojave design. I went to the “offset ribbon” so that I would have plenty of steel on the frame to tap holes for the screws for the ribbon clamping blocks. How about the ribbon material itself? Did you experiment with different corrugations? How did you select the weights (2.5 micron for R-series, 4-micron for Live)? DR: The corrugations on the Royer ribbons were chosen using the “goldilocks” principle: if you have too few corrugations, you risk stretched ribbons and funky high frequency response; if you have too many, getting the gears milled gets expensive and corrugating the ribbon can get finicky. There is a rather broad range of corrugations per inch, though, that will work well. As for the ribbon thickness, as the foil gets thinner, it becomes more fragile and as it becomes thicker, the sensitivity of the microphone goes down and you risk degraded frequency response, so the thickness of foil chosen for the final design must be a compromise. I have tried foils ranging from .9 microns to 6 microns. I can’t recommend the thinner foils due to durability issues, and I can’t recommend the thicker ones due to degraded performance. You mentioned Bob Speiden earlier. The Royer company story says that you’d come across a recording made with Speiden’s stereo ribbon, and that it “changed your life.” What was the recording, and what did you hear that was so influential? DR: There were a number of them, but the one at the top of my list was a recording of Faure’s Les Berceaux. The original was written for piano and voice. The version that I ended up with was a version for voice and orchestra which was breathtakingly beautiful, particularly if you understand the language or have a good translation at hand. Speiden sent me a copy on 7.5 ips reel-to-reel tape (this was before I had digital somethings) and when I flipped the knob to “play” my mouth flopped open. The recording had been done with just the Speiden SF-12 feeding a stereo tape recorder (with DBX noise reduction) and the sound was remarkable in its naturalness, even with the playback being from a consumer tape recorder from 1959! Bob Speiden and I shared plenty of recordings over the years — in later years we could share digital recordings on CDR’s. It wasn’t until the very end that he wound up his microphone cables for the last time. 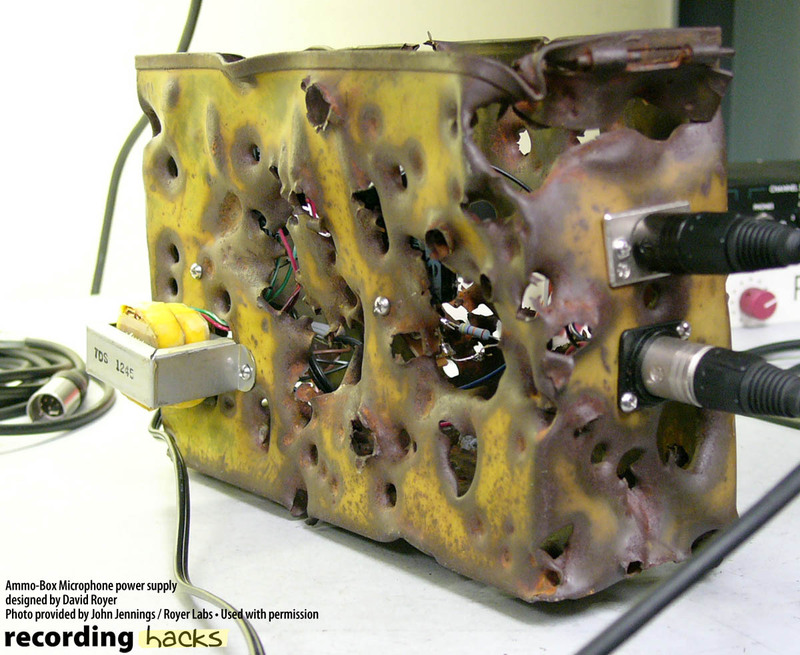 It sounds as if Bob Speiden mentored you in ribbon mic design — first by providing inspiration, then materials and techniques. DR: One of these days I need to share my correspondence with Bob. The earliest letters were exchanged as long ago as 1986. At that point, I had used an early Speiden SF-12, but the only microphones that I had built were small-diaphragm condenser mics, rather like the Mojave Audio MA-100. Getting back to the R-121… the ribbon mic market seems to have been pretty quiet in 1998, with older models from Coles/STC and Beyerdynamic available, but not much else — certainly nothing like today, when there are dozens of contemporary ribbon microphones available. Did it feel like a huge gamble to launch a new company whose first product was absolutely not a conventional, obvious choice for typical audio engineers? You are damn right that we were quaking in our boots. DR: We hedged our bet with a tube condenser microphone, which ended up being eclipsed by the R-121 and the SF-12. But you are damn right that we were quaking in our boots. We made recordings with the ribbon microphones every chance we got, and we didn’t pass up opportunities to show them off. Well, it worked! 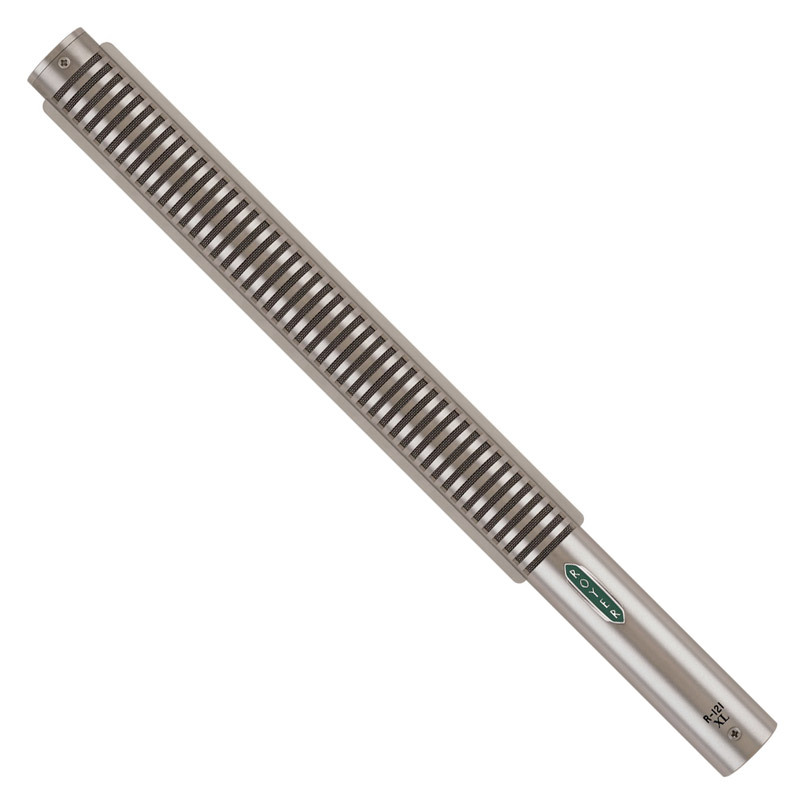 The R-series ribbons are among the most popular contemporary ribbon microphones on the market. Hear them all — including the new R-101, which won a TEC Award in 2011 — in the $60,000 Ribbon Mic Shootout. If you haven’t already, check out Royer’s latest innovation, the “Sling-Shock” shockmount. We covered this in our 2012 NAMM microphone roundup. Special thanks to David Royer and all the folks at Royer Labs, especially John Jennings for digging through personal archives to share the great photos in this interview. 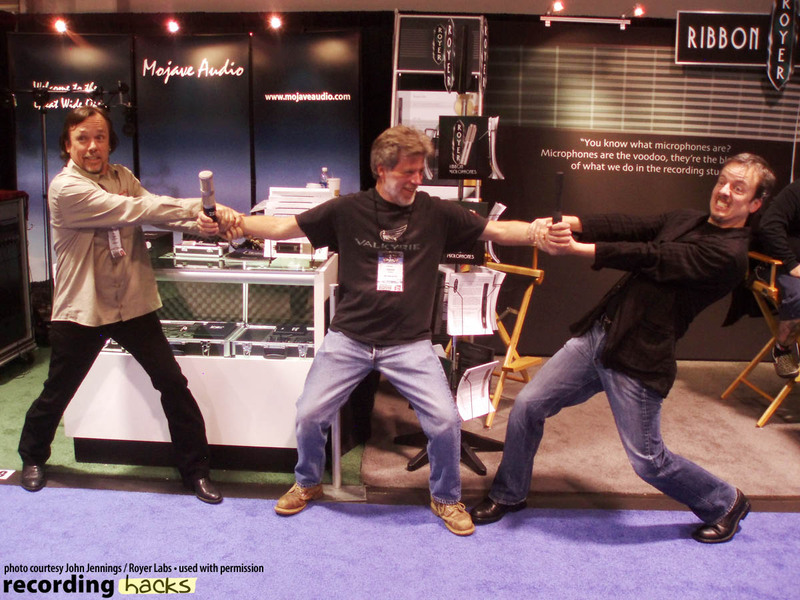 I especially like the pair at right, showing David getting pulled in two directions by his partners in Mojave Audio (Dusty Wakeman) and Royer Labs (John Jennings). There’s not enough of Dave Royer to go around! By the way, can anyone name the two mics Dave is holding? I’ll send some RecordingHacks branded cable ties to the first correct responder via the comments below. Is it a Mojave MA-202ST and a Royer SF-12? I bought an original SF12 many years ago. Bob Speiden was so approachable and generous in his correspondence (written, because this was before the web, and he didn’t seem to have email). Royer has worked on my mic since then and I can truly say has maintained the beauty of the original. It’s gratifying to see this sort of craftsmanship these days. Mojave Audio MA-202ST and a Royer Labs SF-24? We have a winner! The two mics in Dave’s hands are the prototype Mojave MA-202ST, and the stereo SF-24 ribbon. Congratulations to Phil and Jim. I have an old Speiden SF-12 that sounds GREAT! Especialy on EVERYTHING! Busted, dude. . . It was an SF-24V! October 23, 1988 I recorded Buck Clayton’s 13-piece swing orchestra CD, A SWINGIN’ DREAM “live” using only Bob Speiden’s SF-12 ribbon mic. It was for the NJ Jazz Society’s 16th Anniversary celebration. This CD was awarded the prestigious Grand Prix du Disque de Jazz 1989 by the Hot Club of France Federation. Also, it was a 1989 GRAMMY AWARD NOMINEE. As a direct result Buck Clayton, with the entire band, appeared at jazz festivals in France the following two summers. The awesome SF-12 mic deserves the highest accolades for capturing the natural fidelity of the individual instruments and for balancing the entire orchestra. Bob Speiden and I were close personal friends for about 40 years.